Ratings are averaged based on 23 reviews. This is our 2nd stay at Phuket Novotel. The friendly reception staff were ‘always’ lovely & ready to help. The food was fresh & delicious. Kids Club facilities have improved. EVERYTHING was fantastic. The only fault is that there’s LOTS of Stairs to get anywhere, but this was ok for us. Love it here for the stunning views. We will be back one day! Lovely hotel room & a beautiful view could do with updating, resort old & need of restoration, but did not affect our stay though. Staff are great. Overall great value. On arrival we were upgraded to deluxe king rooms with pool access. They were superb! We had an adjoining room for the kids. All the staff were excellent- extremely friendly and helpful! The food was great and the kids loved the mocktails! & we loved the cocktails!! Housekeeping was wonderful and did all they could to make our stay perfect. I Highly recommend this resort!!! Located at bottom end of beachfront up steep driveway. Good service but dated premises showing age even after a refit which must not have been to room we stayed in. Out of the main tourist area which meant quieter. Nice hotel up on hill. We had a good time !! Staff were fantastic. Especially Jay! Went out of way to help everyone. Lots of stairs everywhere. Maybe not so good for older people. Just returned from 10 days. 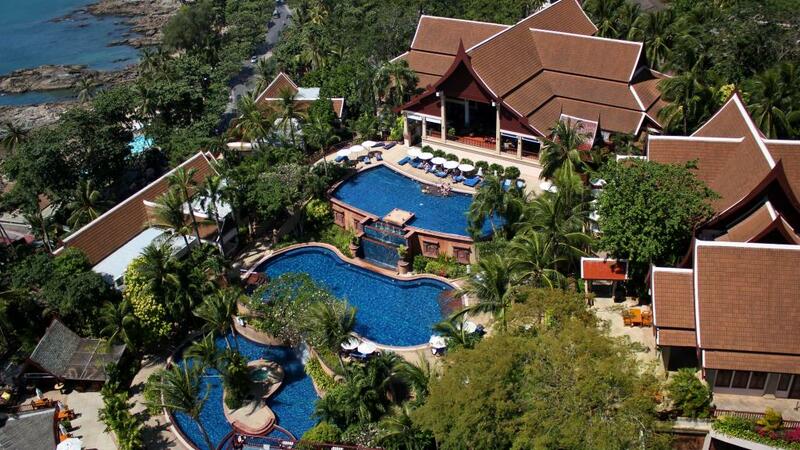 This was our 2nd stay at this hotel and our 12th time to Thailand. The staff at this hotel are by far the most friendliest of all. The hotel is a bit dated but they are in the process of updating. The weather was not good so we did spend time in the hotel - the breakfast, was good with plenty of choice - Alibaba was amazing and had our coffees waiting and the service was always good . At three different times we were asked for any suggestions for improvement. Definitely would stay there again !!!!! Just what the doctor ordered for relaxation !! The staff were fantastic. Kids club is very outdated, old. The 3 Pools were beautiful. Very well maintained. Resort is in middle of renovations, needed a make over. Brilliant holiday destination. Location, facilities and staff were amazing. Highly recommended to fellow travelers. Failry priced. Great room but lacking in some areas. I think the service needs to be lifted in general. Pool side service was not great. There was never anyone to order food from so we had to walk to the bottom pool and ask for someone to come up to us to take our order. Hotel needs to have someone around the guests regularly to be able to order drinks and food. No pool bar so definitely necessary and this would easily and greatly increase their food and beveridge sales. Shuttle service to Jungcelon is great but does not leave the centre to return to hotel on time. It would leave earlier than stated so you would rush to get to pick up on time to find it's already left. Very frustrating. Hotel needs to have a better English speaking staff especially in their own field of work. Eg: Pool side service or room service or house keeping. A little better would be great. Lovely people. Very friendly staff. We stayed at the Novotel Phuket for 12 nights. The two adjoining rooms were well set out each with a day bed by the window and a balcony. There was a bit of street noise and construction noise coming through. The beds quite firm. The breakfast was good with a wide range of choices. I had eggs cooked for me daily. The staff at breakfast were friendly and offered coffee etc. We had afternoon tea in the V lounge daily which was lovely. The food court offered cheap lunches for only 100 baht per serve. The pad thai and roti were both delicious. Many great restaurants within close proximity such as number 9 restaurant, number 9 2nd restaurant and the restaurant at the art gallery. We enjoyed swimming in all three pools but spent most time in the one with the volleyball net and basketball ring. Happy hour varies when it is from bar to bar but consists of half price cocktails and beer. Loved the shuttle up and down between the lobby and street level. Used the shuttle into Patong quite a few times. Overall it was a great hotel but the friendliness of staff is a bit of a hit and miss. Some were exceptional such as Jay. Our room overlooking the ocean was the highlight of our stay and the service from all staff was excellent. Would definately recommend this hotel! We had a wonderful time.Very friendly and helpful staff,accommodation superb and location great.Returned home very relaxed. Very friendly staff, relaxing atmosphere and great place to meet knew friends from both Australia and overseas. Would recommend highly to everyone. The staff were very helpful and friendly. Surprised that the longest serving employee was 2 years! Good location away from the town. Need to vary their dining options to encourage more guests to eat "in house" as the only time the dining facilities were full was breakfast which was included in most packages. Need to enforce their "no smoking" policy in all areas of the resort. Novotel Phuket Resort is located close to everything, all the Management and Staff are very friendly always greeting you with a smile, the rooms are very clean, room service was fantastic, breakfast was also well presented, the pools are very well maintained, we could not fault this Resort and will definitely return. We loved the Novotel Resort in Phuket. We were there 9 days and it was heaven. The employees were so nice to us and took care to help us with anything we needed. The breakfast buffet is to die for! We swam in the pools for hours on end. It was a perfect spot for us. A resort that is a holiday destination in itself. Thank you to Novotel Resort for a wonderful 10 days in Phuket. Although this is not a new resort, it is still very well maintained and the service was wonderful from all staff members. We loved the position, our view & the resort restaurants were very affordable. We had a lovely relaxing time thank you. We traveled as a family of 8 in October 2013, and although a bit of rain at times, was still lovely and warm. We found Novotel Phuket a great place to stay, and would go back there again. I came back with toned legs from all the stairs and walking that we did. The staff were lovely, especially the bell-boys, house keeping staff and day spa staff. Loved the pools, and the quality of service we received during our stay. thanks Novotel! !